The table of contents of this book includes an introduction and then the names of bead artists. It is amazing. "The interviews..., along with brief biographies and photos that showcase each artist's work, are the results of this effort." 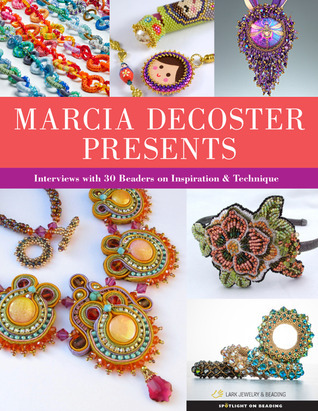 The book includes a wide variety of beading styles "from Nancy Dale's elaborate fringe to Heather Collin's cubic right angle weave creations and Susan Blessinger's multimedia masterpieces. The author states that this book was, in part, made possible by the wonder of the Internet, which gave her the means to admire beadwork from around the world.The shapes and colors are enough to inspire ideas for quilts and other crafts for a few years. The artists are from many different countries and backgrounds. Miriam Shimon shows a piece that would make a fantastic applique', Aurora (pg.11). The necklace has some curves that look like mustaches in beautiful greens and reds tempered by burgundy and gold. Miriams designs are elegant and large.Beki Haley includes natural elements such as a dragonfly (pg.30 on Enchanted) and a shell that looks like an ammonite (pg.31, Ancient Seas) as well as charms and beads that further the nature idea. The work is calming and has interesting textures.I liked Sian Nolan's rich, vibrant colors and thought her piece, Siany Bird (pg.43) was really innovative. It is a flamingo beaded scarf-like piece with feathers. I would look fabulous with a black dress that had a mock turtle collar. Her work includes a needlework case, which is different.Each section includes photos of the artists' work, also some biographical information and answers to a series of questions. Many of the artists make jewelry, but also beaded bags, the "scarf" mentioned above and cuffs.This book is about texture and shape as well as lushness. If you need some inspiration along those lines, this book is one to look at.Take a look!